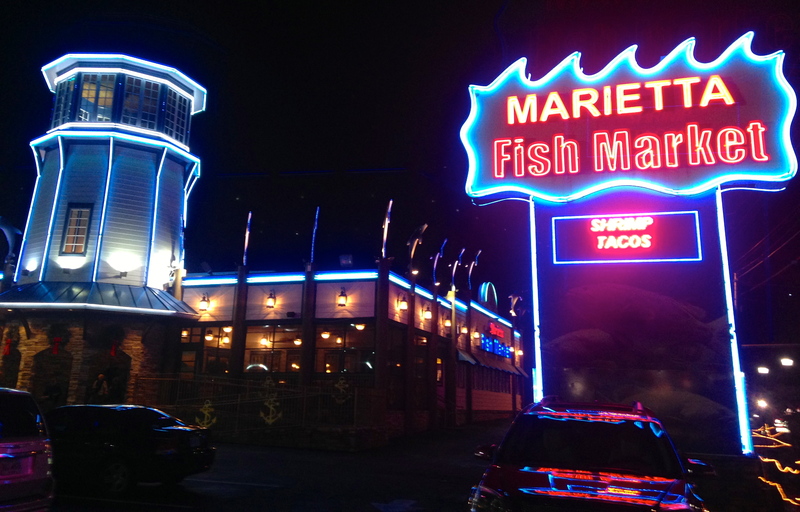 Date Night swims into the Marietta Fish Market. We have eaten here a few times, yet somehow have never made it here on an “official” date. Tonight, we “combo up” as we try many items from their extensive menu. It’s hard to miss the Fish Market on Hwy. 5. All of that neon certainly catches your eye when you drive up. The lighthouse outside is a replica of one we saw last summer in Portland, ME. The market is owned by the same people that own the Marietta Diner. It’s a good place to go to get the same kind of food, without the ridiculous waits and crowds of the diner. 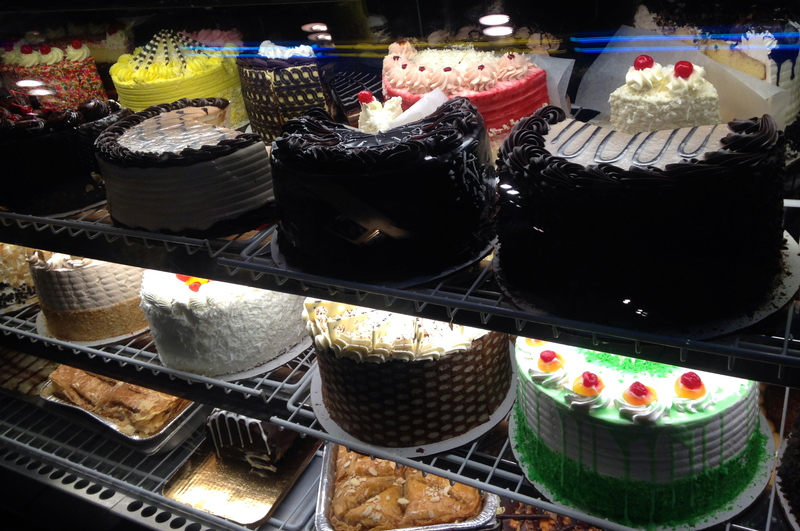 The cake display is a giant warning signal that you should save room for dessert. The food portions here are very large. You might want to negotiate with your date to share an entree so that you don’t leave overstuffed. The neon theme continues inside, which features a lot of “fish art”. This is just part of the dining room. There is a lot of table space here and we have seen them quite busy. You can see much more of the restaurant in our exclusive one-minute Tastemade video, which you can watch here. Our server greets us with a loaf of bread. It looks like an ordinary hunk of white bread until you cut it open. 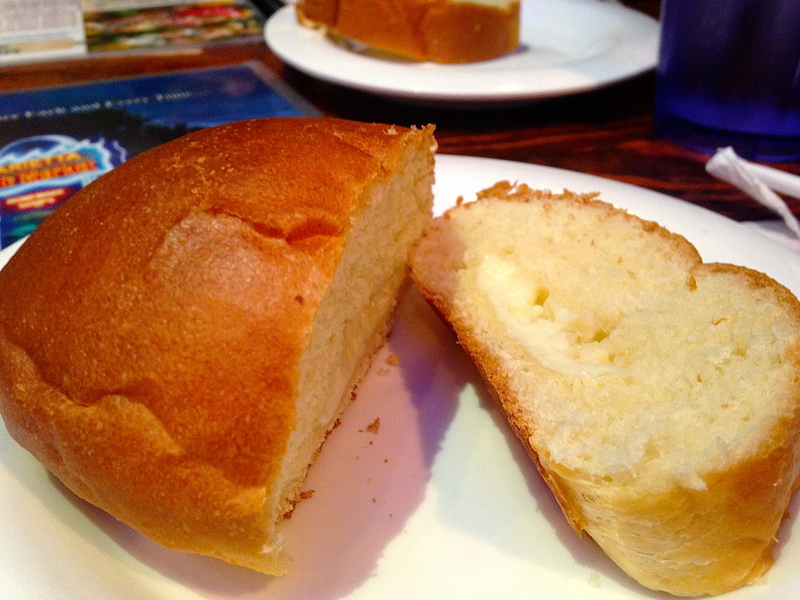 There’s cream cheese inside, which adds a nice sweetness to the bread. You will be tempted to eat the entire loaf, but don’t because as we may have mentioned, there are even better things to come. The beer list could use a makeover and we pass. It’s mostly gas station beer and could be a lot better, but it is reasonably priced. So are the drinks from the full bar in front (we were distracted by the cakes and didn’t take a picture), which are a full $3-$4 less than you would pay if your drink was made by a Buckhead “mixologist”. Wines by the bottle are around $20. Drink up! The menu is huge. You can get your seafood just about any way you want it: fried, grilled, blackened, or broiled. You will have a lot of trouble deciding what to get. Don’t feel bad about telling the server you need more time. While you decide, how about some oysters? 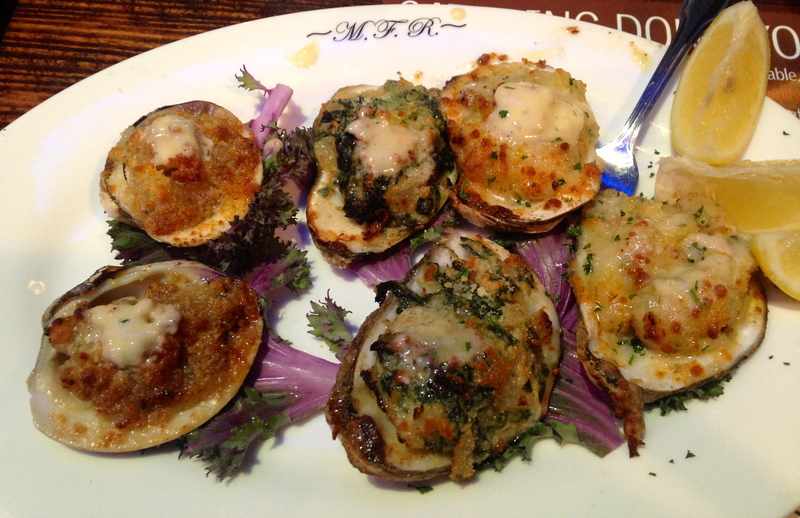 The hot combo comes with oysters Rockefeller, oysters Bienville and two clams casino as well. The Rockefeller is my favorite with spinach, bacon and parmesan cheese in the shell with the oyster. How can you go wrong with bacon? It takes us awhile to figure out what to share. We decide on the grilled island combo, which comes with all sorts of food. 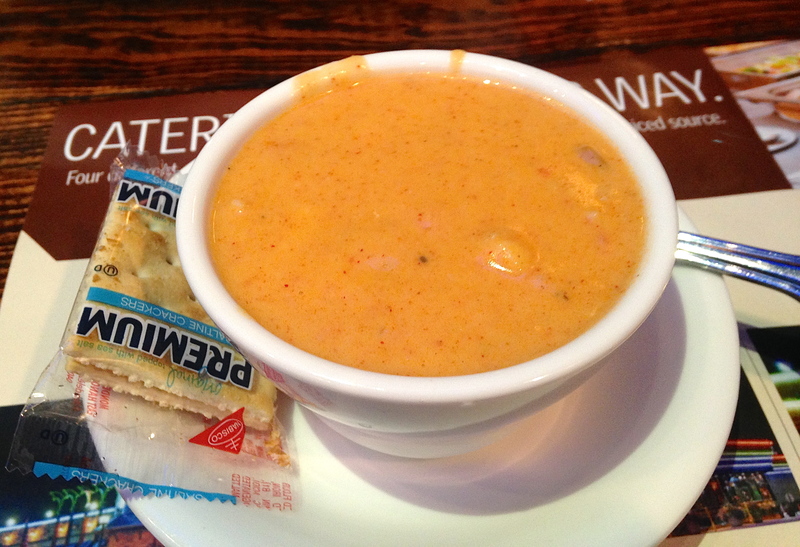 They start us off with a seafood bisque. It’s rich, creamy and full of chunks of seafood. It’s very filling. You could probably eat a bowl of this for a meal and be perfectly happy. Next, the combo comes out. 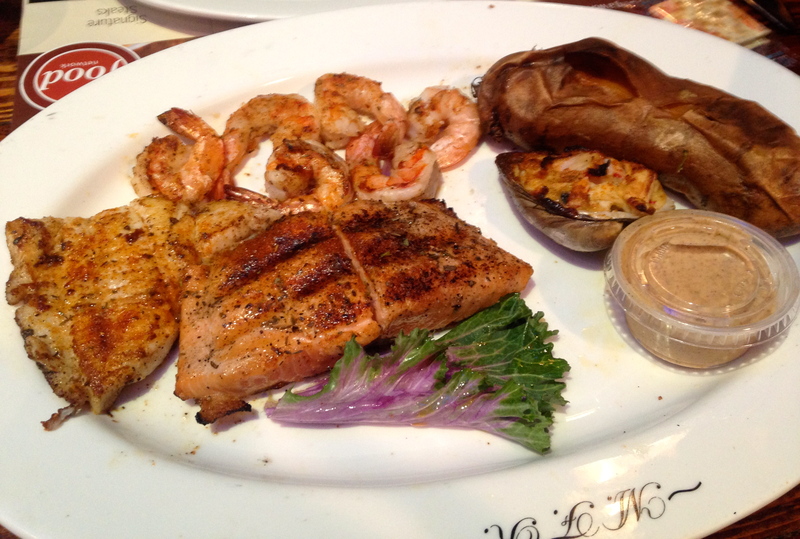 Ours features salmon, flounder, shrimp, a clam, and a yam. It’s grilled, so maybe this is almost good for us. The fish is moist and not overly-seasoned. And since we split the dish, we have actually have room for some of that cake we saw when we came in. We had trouble deciding what to have for dinner. We have even more trouble trying to pick out a dessert. There is someone stationed at the cake counter who is happy to describe anything in the case. It’s almost as fun hearing about the cakes as it is to pick one to eat. Need a chocolate fix? This would be a good place to get one. The chocolate offerings look simply decadent. We pick something that allows us to sample a little of everything. It’s the perfect compromise. 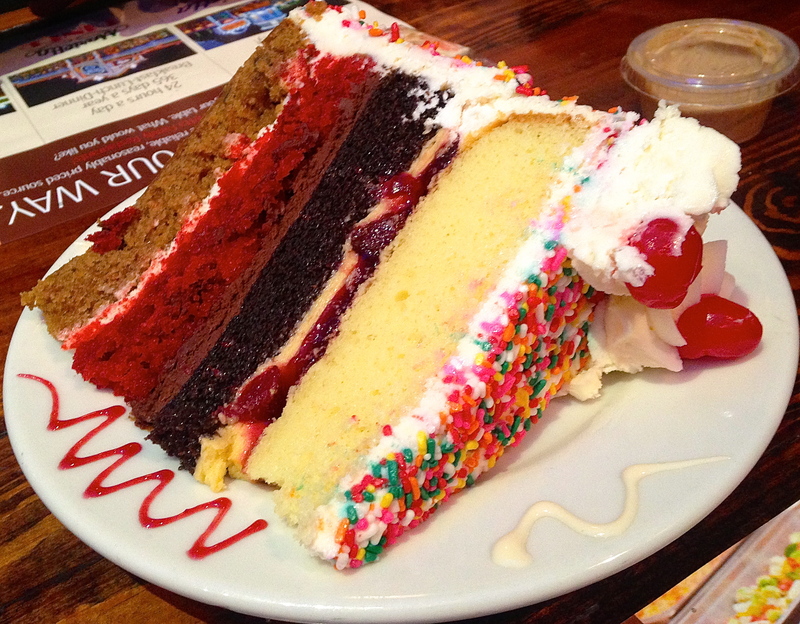 The Crazy Cake is a work of art on a grand scale. There are four kinds of cake in there: carrot, red velvet, chocolate, and vanilla. Each cake is separated by a different icing, cream cheese, chocolate and raspberry. Top it all off with multi-color sprinkles and you have the total package. It’s almost too pretty to eat, but we take the plunge. Somebody has to do it. We take some leftovers home for dessert the next day. Score factor (out of 5): For those who missed it, we are introducing the “score factor” for 2015. It’s just like it sounds, how likely you are to “score” after going here on a date. We were originally going to give it a 2, but because of the cake we’ll bump it up to a 2.5. If you come in just for a late-night dessert, you might even get it up to a 3. The bottom line on Marietta Fish Market: Very enjoyable. We liked it all, from the complimentary bread all the way through dessert. It’s worth a visit just to see the cakes in the dessert case. If you can eat here without having dessert, your willpower is much better than ours will ever be. 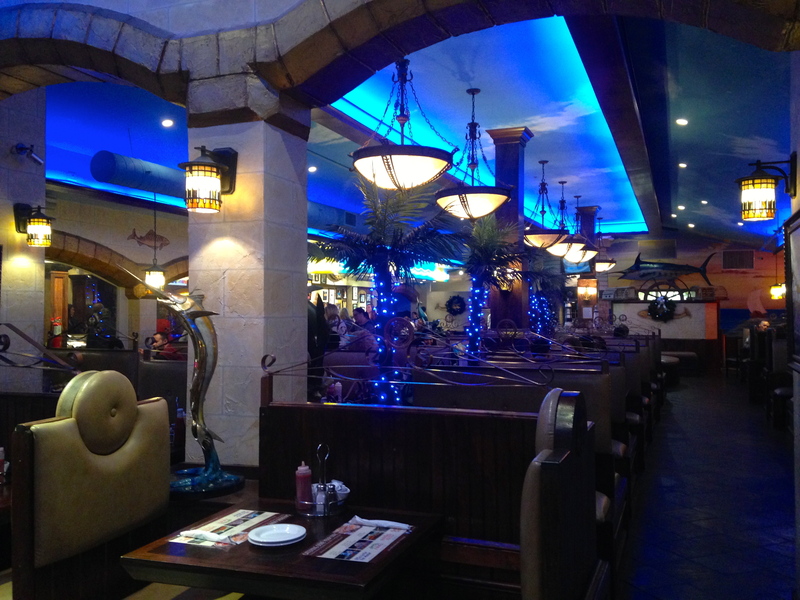 I was eager to read your review of MFM – when I went I was way underwhelmed. It has been a few years. Still don’t think I’ll rush out to eat there, but it may be a decent “go to” place when meeting friends who live north of 120. BTW: I do like Marietta Diner on occasion.